The CFE program aims at increasing the number of cheetahs living in the reserve by reducing the high mortality rate of the cheetah cubs (less than 5% of cubs reach adulthood) during the key moment following their births and till they are 5 or 6 months old when they can more easily escape countless dangers and predators. This program is accepted, approved and monitored by the authorities of the Kenya Wildlife Service, by the Narok County government and by the Maasai Mara University. Less than 7,000 cheetahs remain worldwide, and the number of cheetahs is decreasing dangerously in the Maasai Mara National Reserve: there would be no more than 30 adult cheetahs in the reserve just before the beginning of the program in 2015. The reasons for the fall in the number of cheetahs are complex and the causes multiple. It would be risky to try to find them and to name them with certainty. However, with 25 years of on the ground observation and experience, we can highlight four mains reasons: destructions of litter (by lions, leopards, buffaloes, snakes among others), predation (by leopard, martial eagles, hyenas, the latter being present in an unsually high number in the reserve), human activities (illegal intrusion of big herds of domestic cattle by day or by night, harassment by careless actors of the tourism industry, poaching to fuel cheetah cubs trade towards arabic peninsula), reduction and destruction of the habitat that depleted the Maasai Mara ecosystem of the shrubs that provided hiding place for cheetah litters. In the hope to decrease the cheetah cubs mortality, the Cheetah For Ever program protects the cheetah mothers in charge of very young cubs: a motorized brigad consisting of a scout (hired by CFE) and a ranger of the reserve stays 24/7 with the family (at a safe distance), and is ready to intervene by pushing away any potential danger, or harassment by tourist cars. During the previous 3 years, the program allowed to lead to adulthood 11 cheetah cubs that were almost all preserved repeatedly from hyenas and lions by the scouts of Cheetah For Ever who had either pushed away the predators, or made to fail the attacks of the latter by alerting the cheetah mothers or by protecting the flight of youngsters when attacks occurred. These 11 fully grown cheetahs were added to the pool of 31 adults cheetahs, a number issuing from a study released in 2014 before that the CFE program starts, a study published at the end of 2016, and which estimated the number of adult remaining cheetahs over the 2400 square kilometers of the reserve and its bordering conservation areas. These 11 cheetahs preserved thanks to the Cheetah For Ever program increased in a significant way the Mara cheetah population since they constitute one quarter of the adult cheetahs living now in the Maasai Mara ecosystem. The second part of the program deals with the education of the Maasai kids. The following activities are regularly organized for the school children who live in the neighbouring of the reserve: educating outings, safari visions, collecting of plastic waste, plantation programs of local trees, etc. For more information visit Cheetah For Ever. 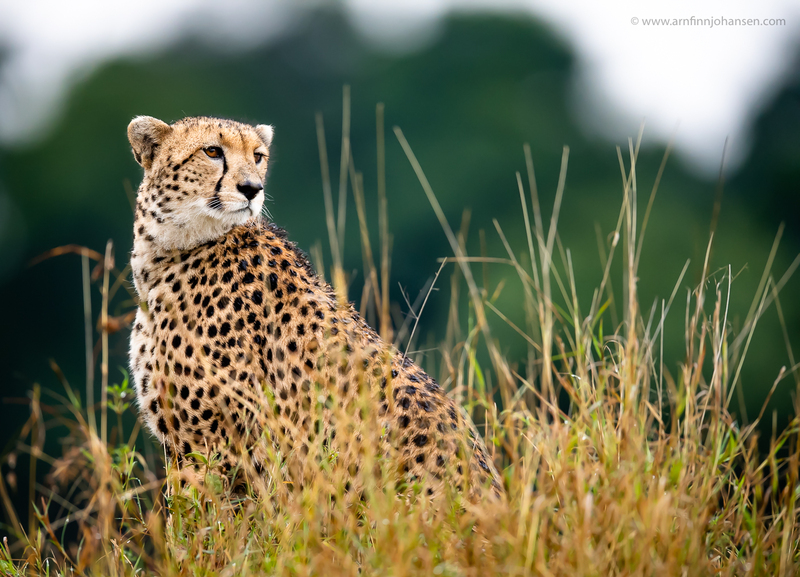 The cheetah female known as “Imani” photographed in Maasai Mara in August 2018.